The Electronic Health Records (EHR) Work Group was created by the AAN in 2004 to identify EHR products that meet the requirements of neurologists working in small practices lacking the resources of large groups. It was clear that EHRs are typically designed for primary care physicians and that those functionalities appropriate for the general market did not always work well for our specialty. 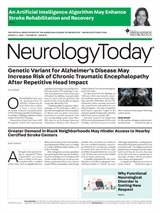 Over the past three years, members of the EHR Work Group have evaluated a variety of products from the perspective of neurologists' unique needs. We've learned that it's easy to confuse the salesperson with the product and that it's hard to pin the vendors down as to exact cost. We have picked up other lessons along the way and a few tips we'd like to share for those of you thinking about selecting an EHR. To make sure that the demonstrations are relevant to your practice, you need to run the show. Demonstrations driven by salespersons tend to be quite slick. They are rehearsed to make the product look easy to use, and imbued with bells and whistles meant to dazzle. But, when you hand them your own script, flaws are more likely to appear. They may fail to recognize some neurological terms or examination findings, or to identify common drug-drug interactions. “As we have gone through the evaluation process, one of the most illuminating steps involved setting a clear group of pre-designed history and physical exam findings, and asking the vendors to chart them,” said Bruce Sigsbee, MD, member of the EHR Work Group and AAN Treasurer. “The differences in the products were much more evident, even when scripts were sent out in advance,” he added. Each year, the EHR Work Group has also asked the vendors to add additional information at the time of the demonstrations. This adds the element of surprise and lets us see how truly ready they are for neurological patients. Even if vendors describe a product as being interoperable with outside labs, for example, it's important to define this service more precisely. “Some companies limit what you can retrieve electronically based on whether or not you draw the blood at your office. '” said William S. Henderson, a member of the AAN Practice Management and Technology Subcommittee. Henderson, the administrator of Upstate Neurology Consultants, a seven-provider practice in Albany, NY, transitioned his practice to EHR in 2004. “Others provide the information online (via a secure portal), but they may not have an easy way to integrate the Web data into your EHR,” Henderson pointed out. He added that he discovered that products may have limited lab access; he is able to incorporate data from LabCorp, for example, but not major local labs, such as hospital labs. Software vendors have a plan for implementation and want you do it their way. They choose what they do best, not what is necessarily best for the practice or physicians, he pointed out. Don't skimp on the training. The more training, the more avenues of delivery, and the greater your chance of success, Henderson noted. People of different ages and degree of computer sophistication need different types of training to achieve the same ends. That is why Henderson urges a full-orbed offering of training methodologies by your vendor. He added, “If they don't have it, skip them!” He learned this the hard way. Until 2003, his vendor offered practice management training twice a year out of state. If his hiring was timed wrong, it was a long wait. Now he begins training his staff with a CD-based program on day of hire before he hands them over to a team trainer. “The nature of documentation is at a crossroads,” said Daniel B. Hier, MD, MBA, vice-chair of the EHR Work Group. “Traditionally medical records were populated with narrative text — reports that told the patient's story — and physicians who wrote consultation letters with clarity, elegance, and style were admired for their ability to document a patient's history and findings in a way that was aesthetically pleasing,” he said. Electronic health records are changing much of this. Even though terms like MS and multiple sclerosis describe the same entity, explained Dr. Hier, a computer program or a database stores the information as ICD-9 code 340. “In order for decision support to work,” he continued, “data in EHRs must be discrete and encoded: If the EHR includes 340 on the problem list, it can check the med list to see if immunomodulator therapy has been ordered.” But the Meds List must be similarly discretely coded so that logical rules may be applied, he pointed out. To determine an E&M code, the history and the physical examination must also be discretely coded (for example, reflexes must be a data element and not just free text), so that the elements can be counted. Dr. Hier, who is the education editor for AAN.com, also believes that discrete data elements will eventually be the basis of the Performance in Practice critique of patient care, a component of the maintenance of certification. It will be too cumbersome to critique narrative text; automated algorithms will critique care documented in EHRs as discrete data elements. The AAN will host the third annual Electronic Health Records (EHR) Chart Challenge at its annual meeting on April 15 in Chicago. This year, the vendor demonstrations, held in the exhibit hall between 1:00 PM and 4:00 PM, will be open to the general membership. For more information and registration: www.aan.com/go/practice/electronic. Neurology Today8(24):15-16, January 3, 2008.